No guesses on the "What IS It" challenge from July 24, eh? Should I give the answer? That piece of machinery with all the crazy wheels actually is called a "crazy wheel," and it's a kind of braking system for logging sleds that areloaded with timber. A cable was attached to the sled so that, as horses pulled the load downhill, it didn't go crashing forward and mow the horses down. The cable wrapped around the wheels to generate the braking action. Here's an easier one, also from the Lumber Museum in Blind River. Yup, it's a hammer, but notice it has a number on the pounding face. 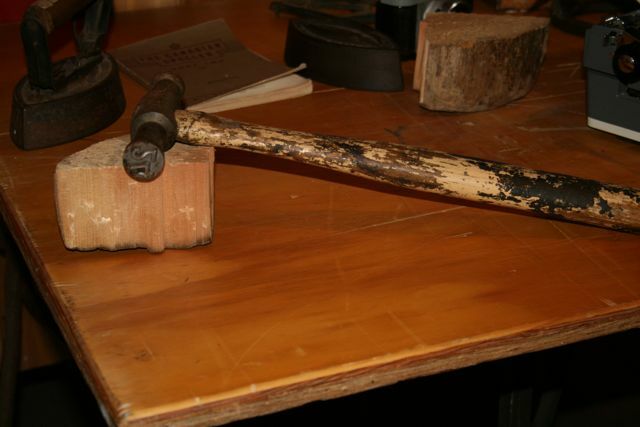 This hammer is never used for pounding nails; it IS using in logging. So, what IS it? Identifying which logging crew owns which log? Identifies the logging area from where the trees are harvested. Now, drum roll, what is it? Aruba, Jamaica . . . Michigan!